Oriental Canteen is a tiny restaurant near the South Kensington tube station. I stumbled upon this place when I was at The Kensington Creperie, but didn’t give it much thought as my aim was to eat crepes. But my chinaman brother wanted to eat rice, after 4 days of sandwiches and kebab. From its name “canteen”, it is not the best place to go to when you’re on a date. 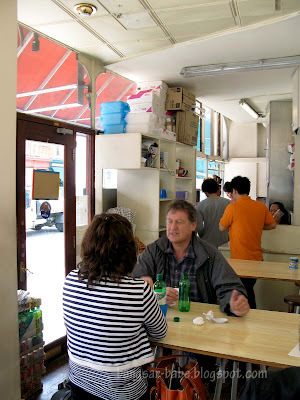 Expect to touch elbows with other diners as the place is cramped, with un-lacquered wooden stools and tables. Our food came quickly. 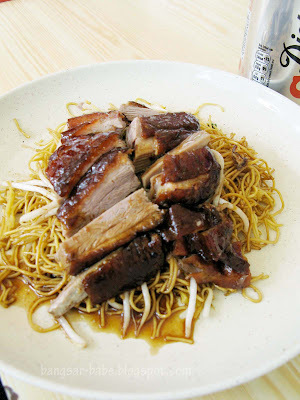 My duck chow mein (£5) was a decent-size plate of noodles, sprouts and roast duck. It didn’t look like chow mein to me – it’s almost like our kon-loh wantan noodles. The noodles tasted decent, albeit slightly on the salty side. I would have preferred the duck thigh and drumstick, but they gave me the breast – not a fan of breast meat, as I find them a bit too lean and dry. 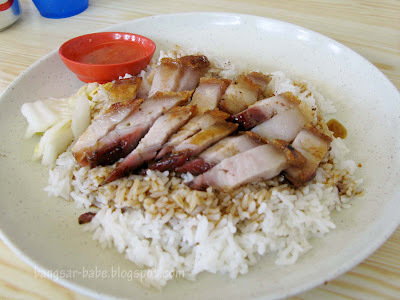 My brother’s siew yuk rice (£4.50) was nothing to shout about. The siew yuk was dry and the skin wasn’t at its crispy best. If there’s anyone in who can out-eat me, it’s probably my brother. He eats rice like nobody’s business. We ordered ½ a roast duck (£8.50) to share, and he asked for another BIG bowl of rice to go with it. *_* Like Four Seasons and Gold Mine (wait for my blog post on those two places! 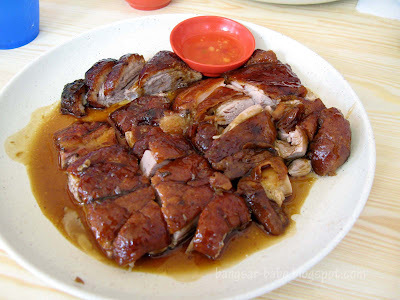 ), the roast duck here was deboned before it was served. It tasted alright – not bad, but nothing memorable either. The duck was meaty, but it lacked crispy skin and melt-in-the-mouth fat. 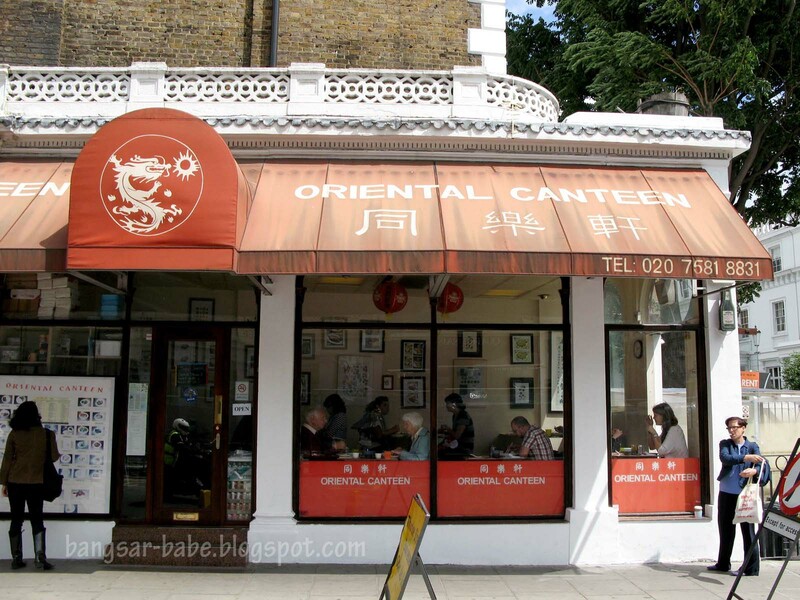 This is one of the cheapest (and decent tasting) Chinese places in South Kensington. Food wasn’t fantastic and the ambiance wasn’t great, but they did mention it’s a “canteen”. Don’t expect to be able to stay long, you might get shoo-ed away. Go there, sit down, stuff your face, and be on your way. 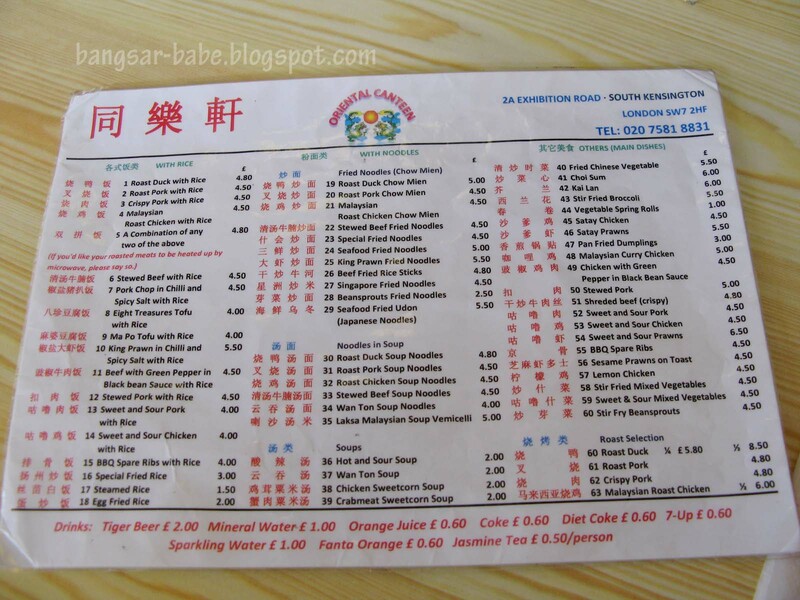 Verdict: If you’re craving looking for a quick bite or Malaysian/Chinese food, try this place. ohh i love this places..hahah..plenty of them in melbourne too. 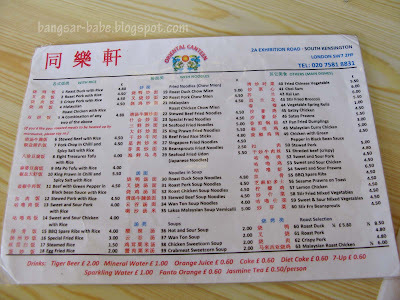 Oh I love this type of cheap and mean mom & pop Chinese diners… when I lived in NZ, they saved me from nights when kebabs and fish & chips just won't do. Dirt cheap too!